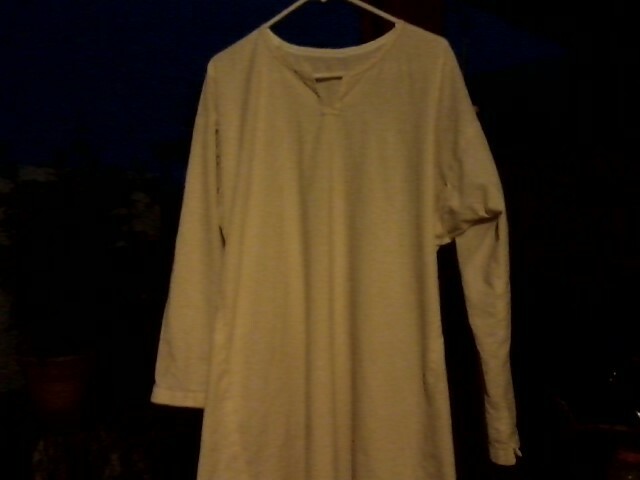 And the chemise/smock is done! I’ve been enjoying Fashion Revealed’s Tumbler page of corsetry, hose, shifts, slips, early bras, bustles and hoopskirts from (mostly) various museum collections. You might too! 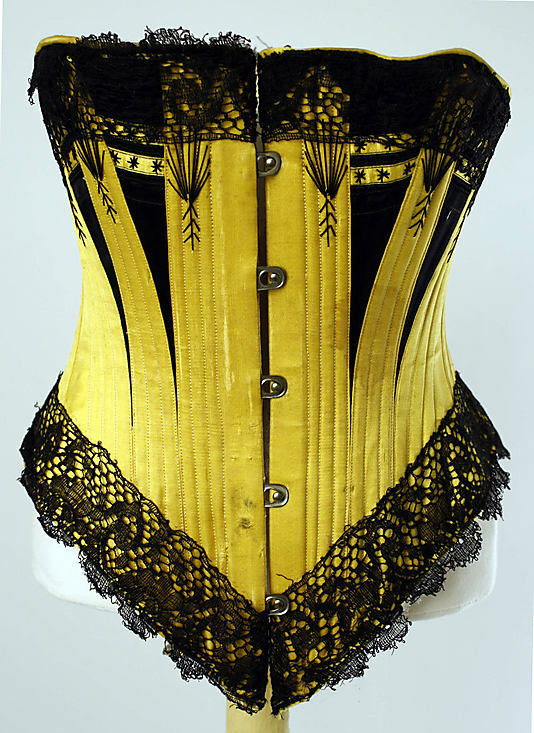 The above corset is a lovely silk number in the Met‘s collection. J. was the first person to introduce me to the phenomena that is the Renaissance Faire. She left the faire circuit a few years ago, but recently decided to come back to it. In coming back and joining our guild she decided that a whole new costume was needed. She also wanted it to double for both Peasant and Pirate. We went with a Scottish style bodice pattern by Simplicity, that intentionally does not close all the way at the front. As she likes the more natural colors, we chose a chocolate-brown medium weight linen fabric. The inter-lining is a natural colored cotton duck cloth, and the lining is a similar colored cotton fabric. The chemise is a natural muslin with cotton drawstring for the neckline and wrists. The skirt is the same brown linen as the bodice. It is left open at the front and is tacked open for aa nice draping effect. Close up of a Victorian chemise under a waist cincher corset. Despite what “bodice ripper” romance novels may tell us, very little bodice ripping actually happened in Victorian times. Not through all those layers! A lady in say, pre-1856 (when the crinoline was invented), wore a minimum of a chemise, corset, corset cover, possibly 5 stiffened, flounced petticoats (infrequently washed and highly unsanitary), her dress or skirt and blouse and probably a coat or shawl because she was cold. Oh, and pantalettes, if she should choose (though it was considered vulgar to speak of a woman’s nether limbs, so don’t ask her). These were two separate legs tied at the waist, no crotch). Try ripping through all that bub. A corset was never worn next to the skin. A woman would want to protect her investment in complicated and double sewn canvas (or preferable coutil – a tiny-weave herringbone, that didn’t stretch) and bones (first wood or whalebone, later spring steel). A chemise would protect the corset from her skin and her skin from the corset. To some extent. The chemise, depending on her station in life and her capability to fund a full wardrobe, might have been her nightgown as well. Lest my tangent continues… This particular chemise is made of fine lawn. It is very full and gathers into a narrow neckline. It falls to the knee and is decorated with delicate lace at neck and armhole.